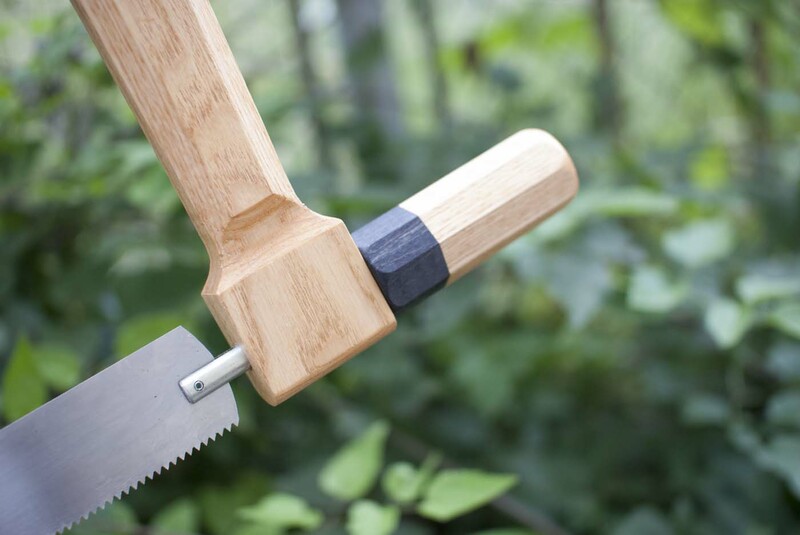 Saws have long since been lacking in my collection of tools. So over the past six months or so I’ve begun working on that. 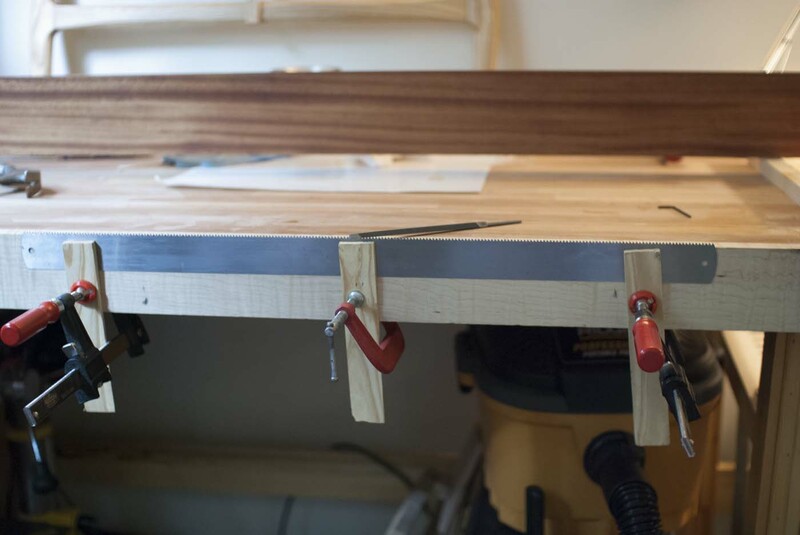 I built the Gramercy bow saw, picked up a Veritas dovetail saw and now I’ve completed a frame saw in hopes of adding a coarser saw to the lineup as well as the flexibility of an interchangeable blade. 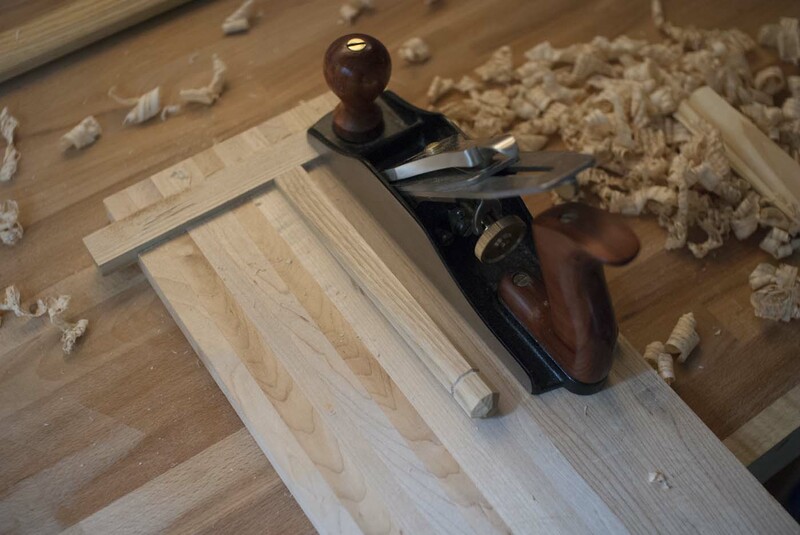 The design is modeled after the smaller Gramercy saw. 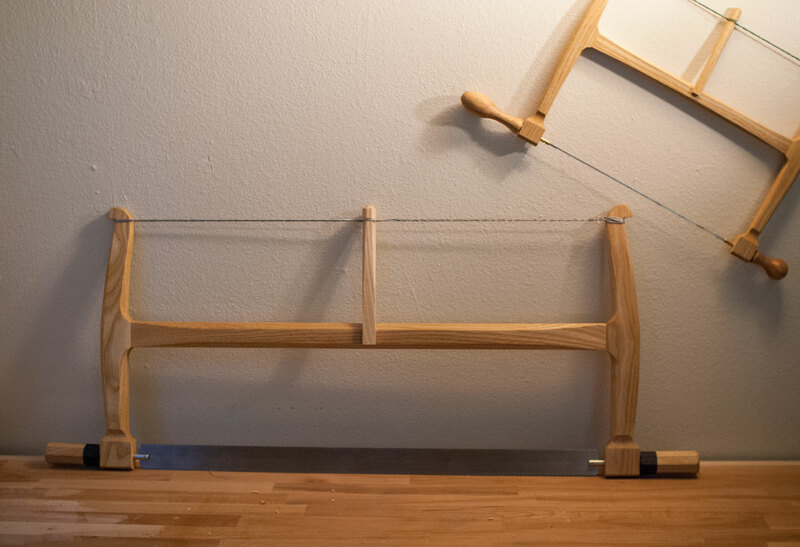 It’s more or less been scaled up to accommodate the 700mm blade (from highland woodworking) while adjusting the proportions so that it’s not unwieldingly tall. 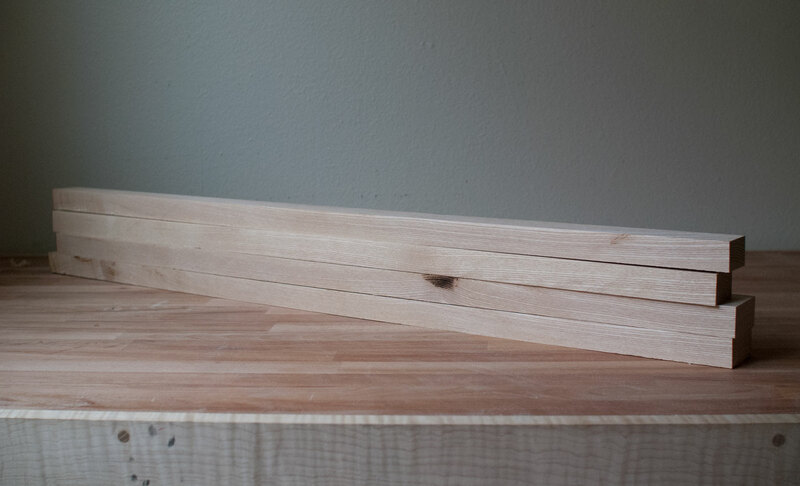 I made the handles octagonal because I don’t own a lathe. Attractive and specialized hardware proved difficult to find, but enough digging turned up these toggle anchors that work quite well. And for the tensioning string I picked up some 300lb test braided fishing line from amazon. 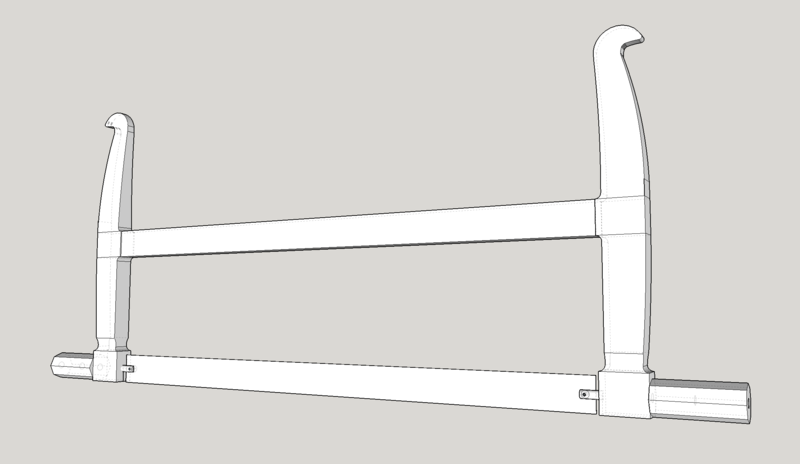 If you’re interested in using the sketchup model linked below, please note that I made some modifications throughout the build that are not reflected in the model. 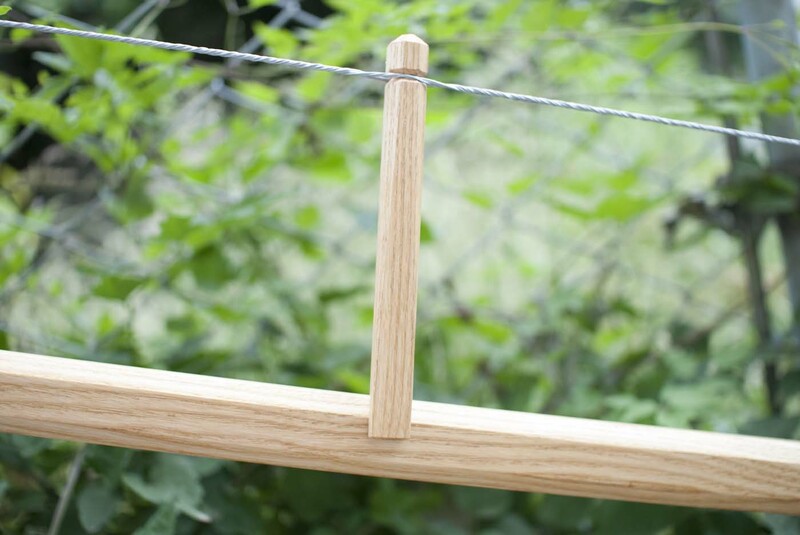 The 1-1/2” diameter handles felt too big so I scaled them down to 1-1/4”, the hooks at the top that catch the string were scaled down for aesthetic reasons and I also beveled and/or rounded most edges. The latter was just more work to model than it would have been worth. So it begins. I grabbed some ash I’ve had around for a while and ripped it down to rough dimensions. 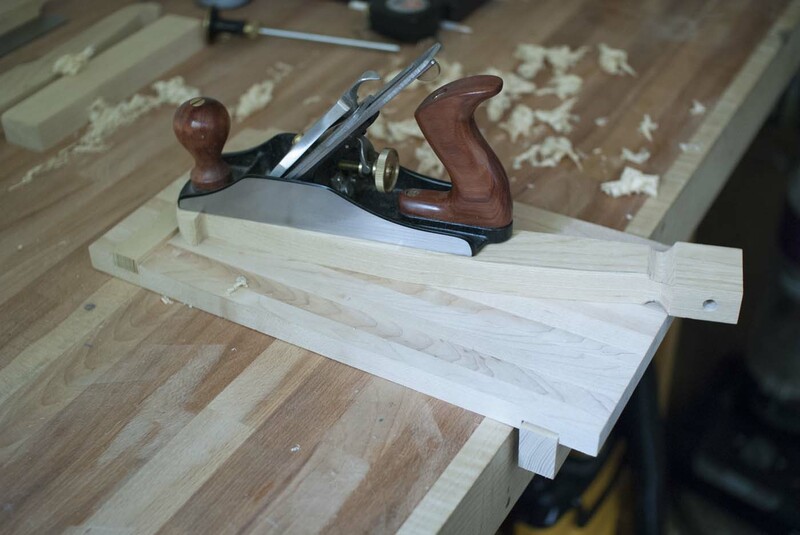 I usually get very close with my table saw and perfect dimensions later with planes. This is mostly because I work out of an apartment and have to carry my saw outdoors and saw near my neighbors. So I try to keep the time I use it to a minimum. 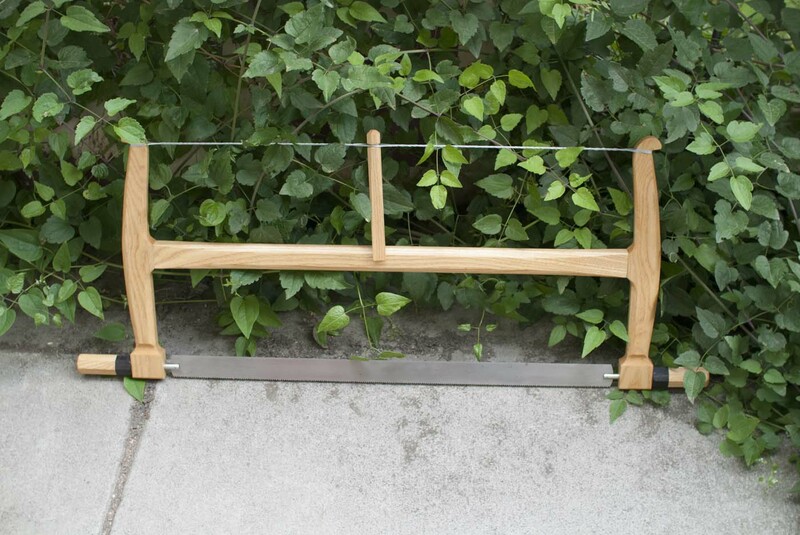 Plus it gives me some room to cleanup surfaces when my cheap fence wants to flex or I otherwise botch a cut. 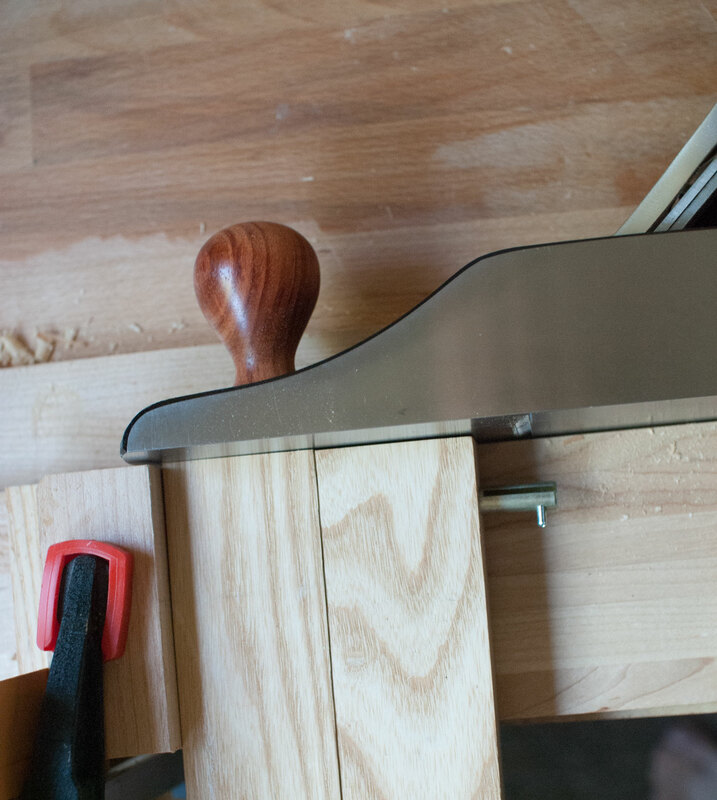 I have a planer jointing sled that doubles as a large bench hook. 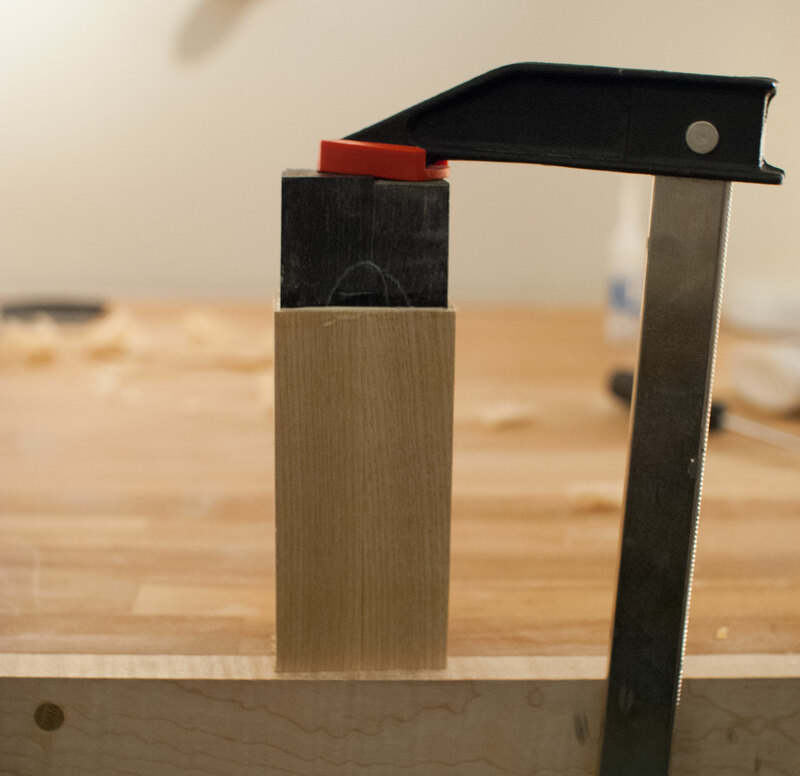 Paired with this, my #6 brought everything down to correct thicknesses fairly quickly. 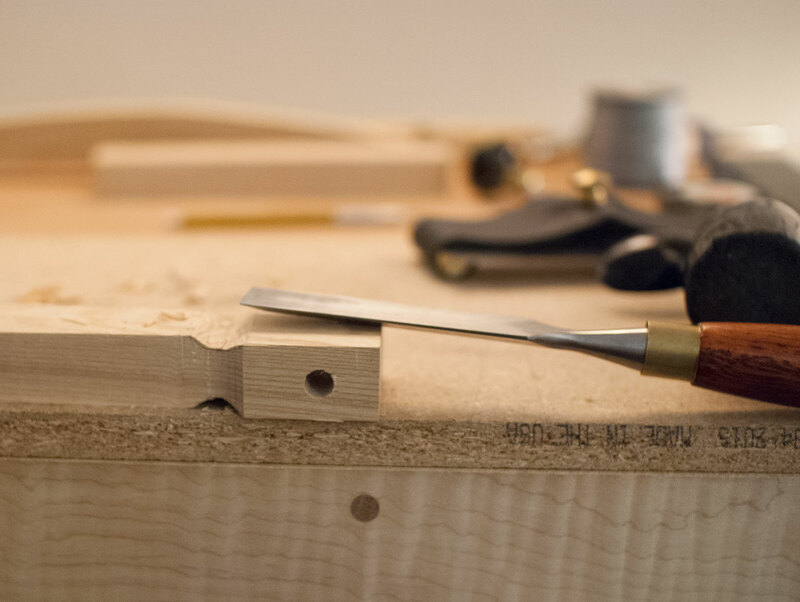 Here I am crosscutting pieces to rough length. 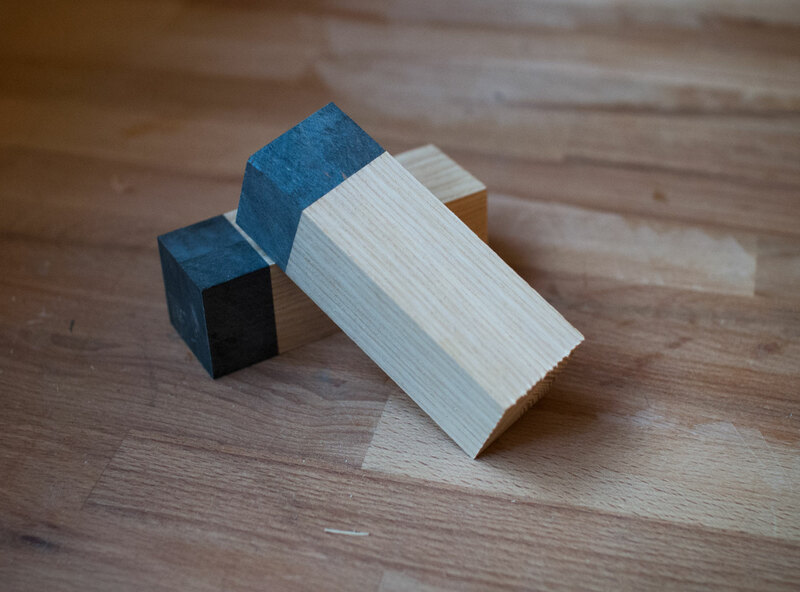 This small dozuki was my only crosscut saw and, although it works, 20tpi is a bit much for rough cuts (a reason for building the frame saw). Not to mention it’s too small for a lot of stock. Rough cuts to length and basking in the spring sun. I’m still loving this blue mahoe and have enough scraps for a few more small projects. I thought it would make a nice contrasting accent against white ash. 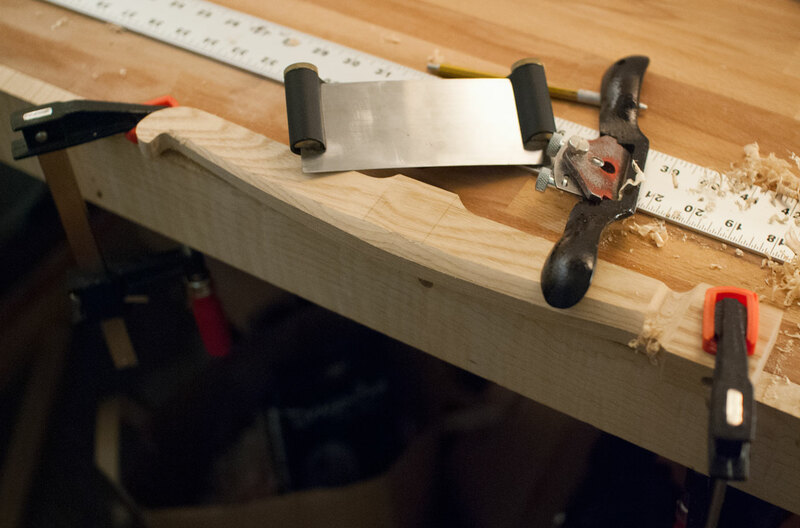 All I have are relatively small scraps so I had to laminate it twice to get enough thickness for a handle. 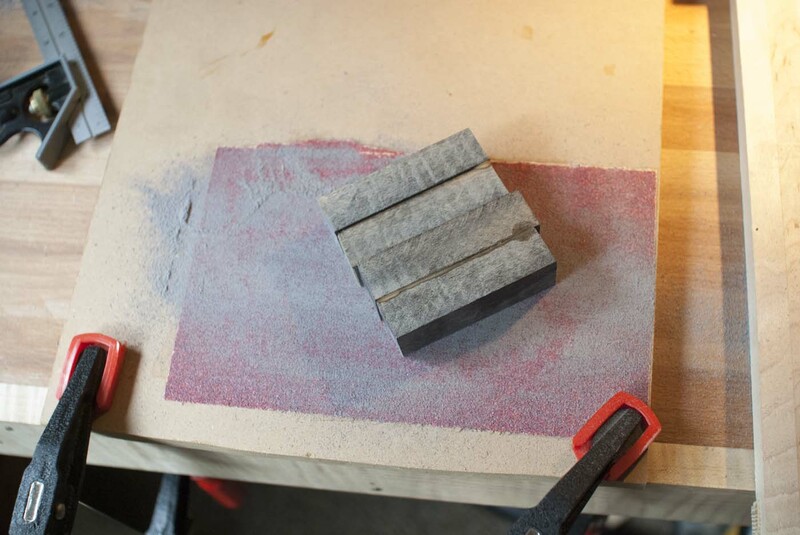 After the first gluing I used this MDF and 80 grit sandpaper to joint a fresh edge for the second lamination. 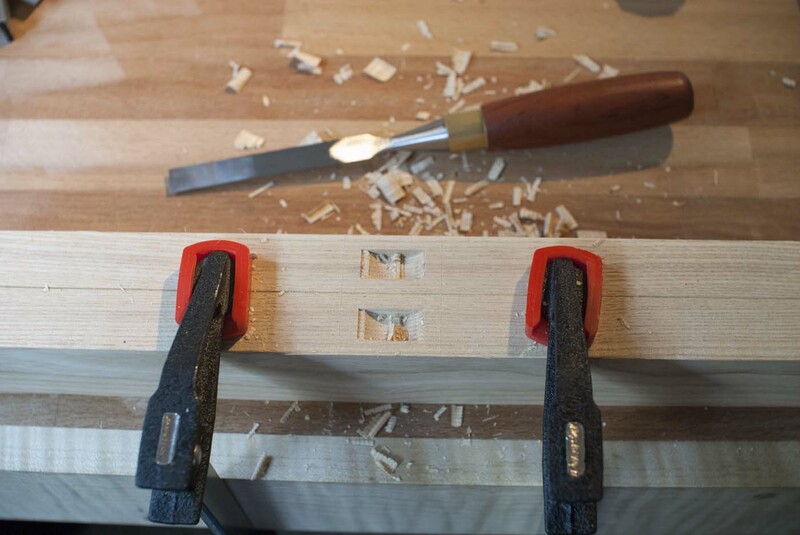 Then after cutting the block in half I glue each piece to a corresponding piece of ash. 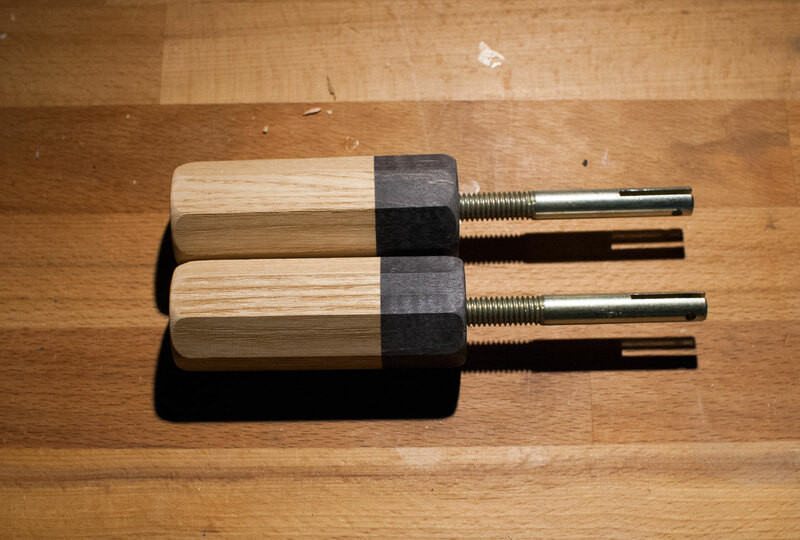 The joints are end-grain to end-grain but they’re in a low stress area and will soon have bolts epoxied down their centers. After trimming everything up they’re looking pretty nice. 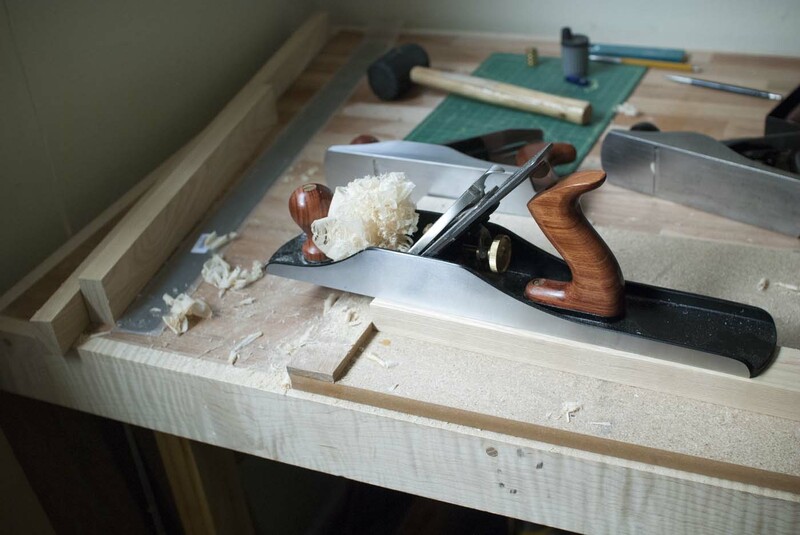 A bench hook and a planes make pretty easy work of shaping square pieces to octagons. 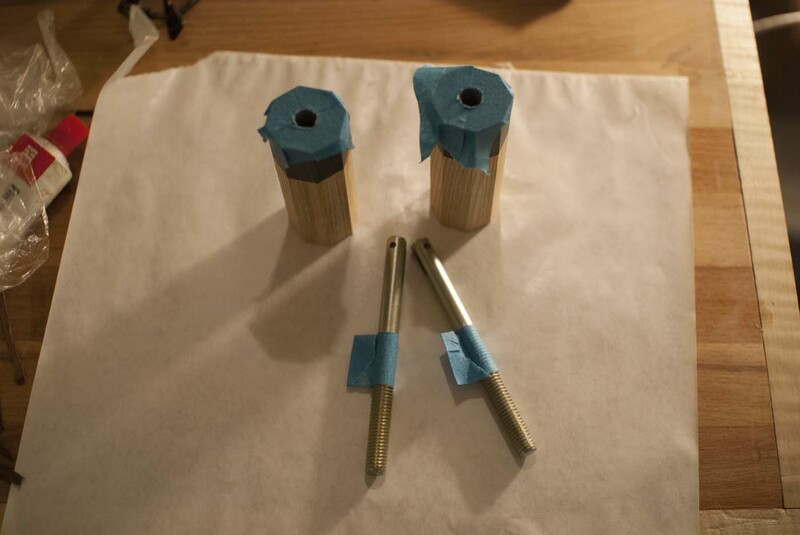 After drilling center holes, I taped off the ends and the hardware and set them together with epoxy. 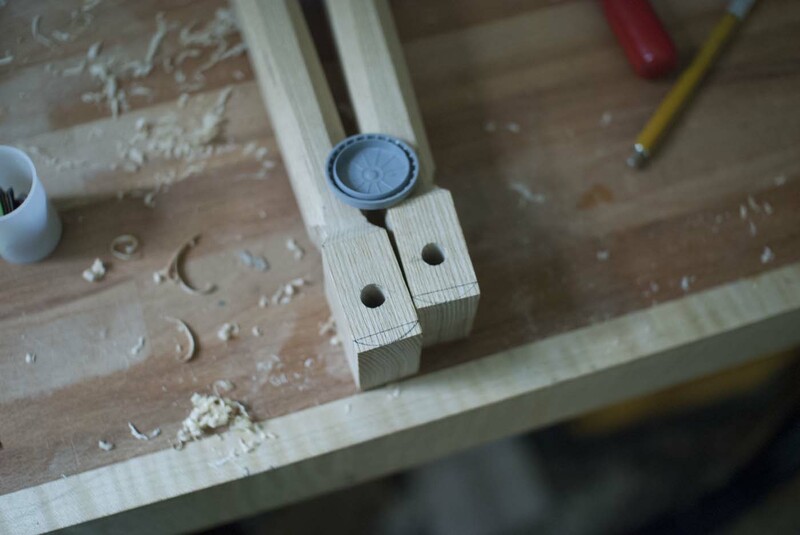 With an appropriately sized hole the hardware was very easy to self thread into the wood while using the toggle key as a driver. 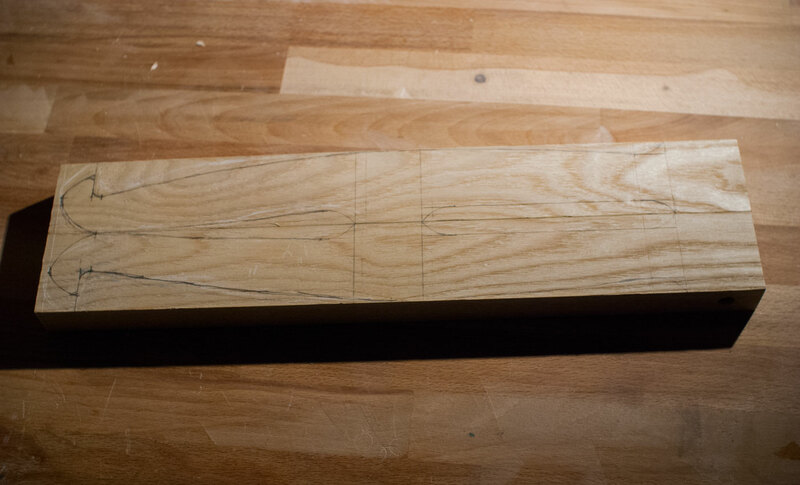 Lastly, I rounded off any sharp corners/points. 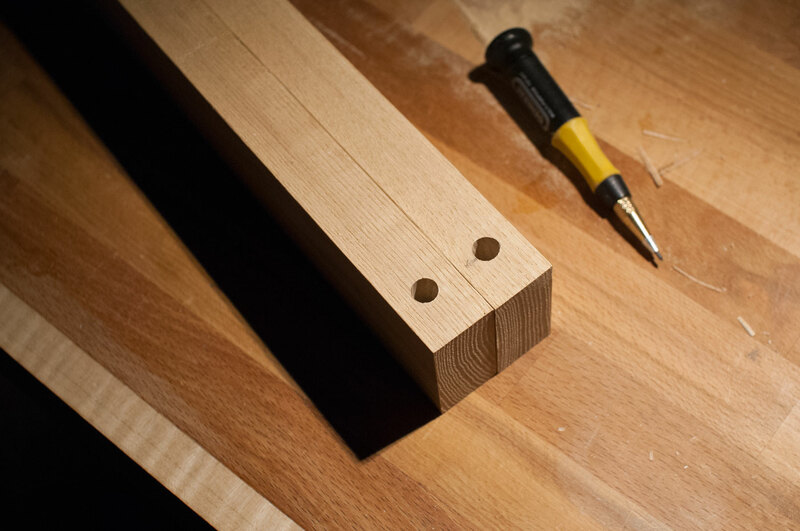 Next I drilled the hardware holes with a drill press and centering punch. Afterwards I pushed an extra bolt through both frame sides and matched the distance from the hole to the bottom on a shooting board. 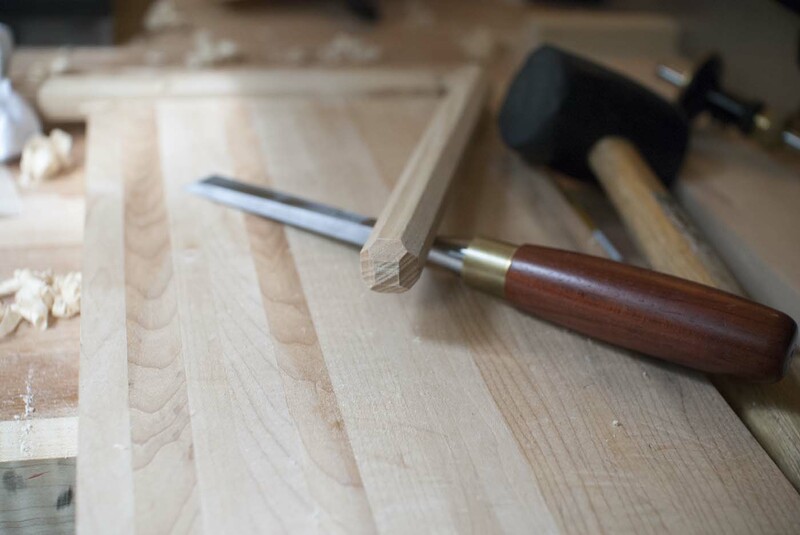 The mortises were marked and chopped by hand. 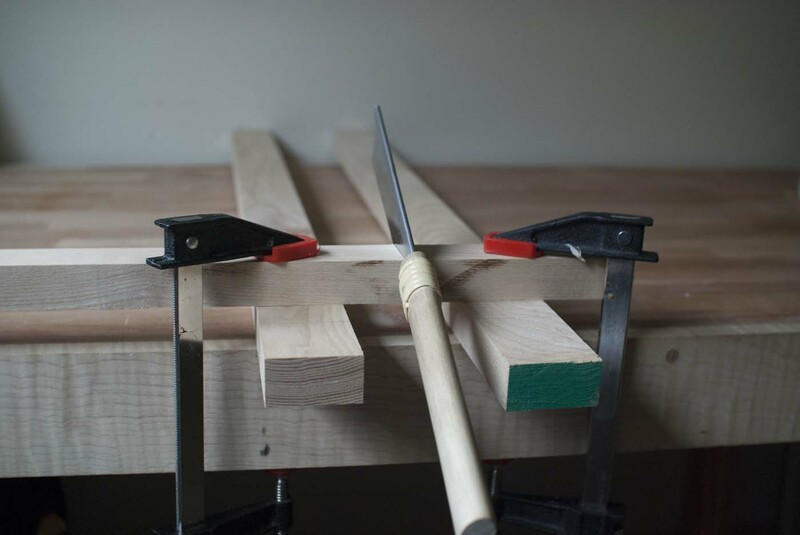 I also cut tenons to match but apparently didn’t take any photos of the process. 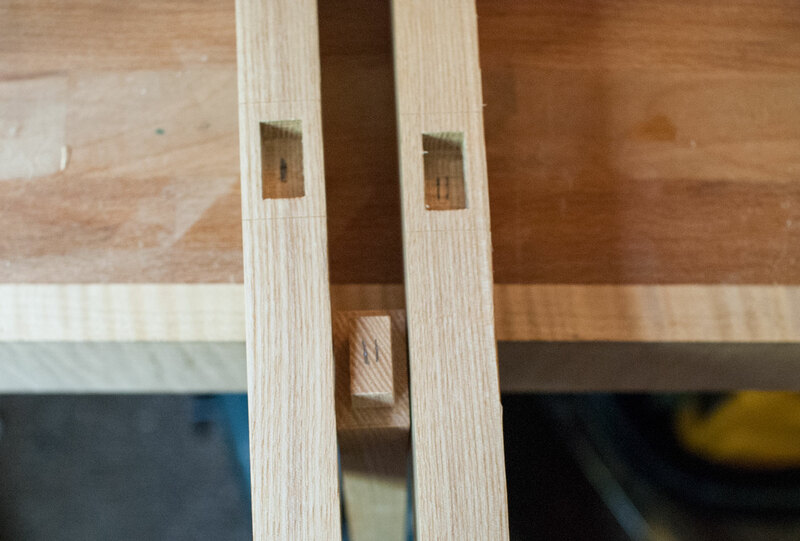 Once the joints were fully fit I labeled them so I don’t forget the way it best fits together in the future. I marked out the key points along the frame side shapes and then connected the dots using a flexible sheet of cardboard to model the curves. 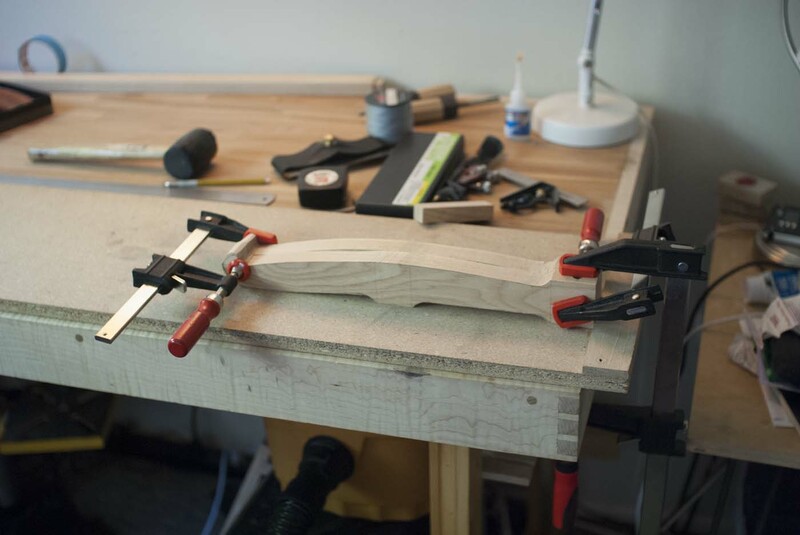 I rough cut the curves with a bow saw and then cleaned them up with a spokeshave, a chisel, a scraper and a dowel wrapped in sandpaper. 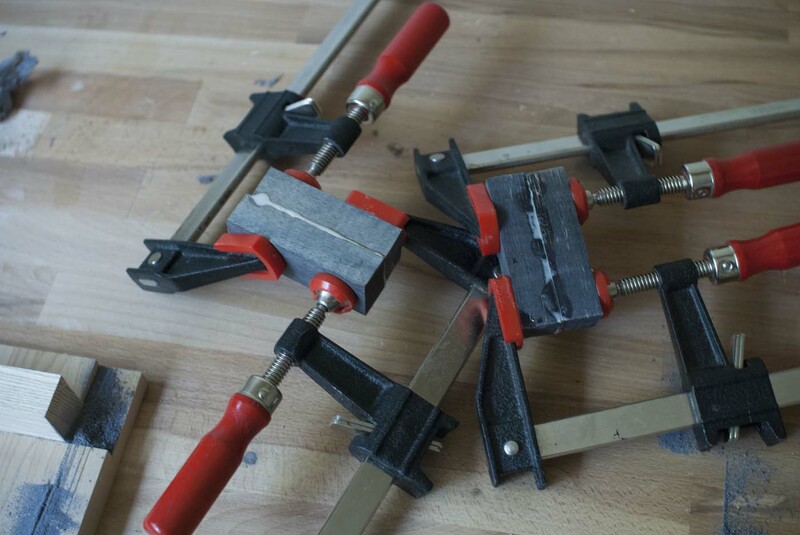 Next I clamped them together and further matched the shapes with the same tools. 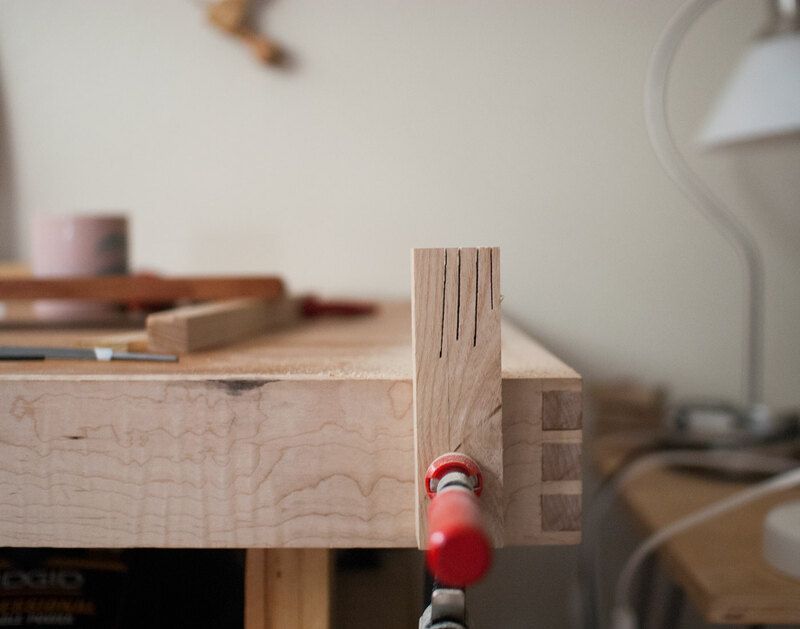 A chisel and sandpaper wrapped dowel make quick work of the recesses. 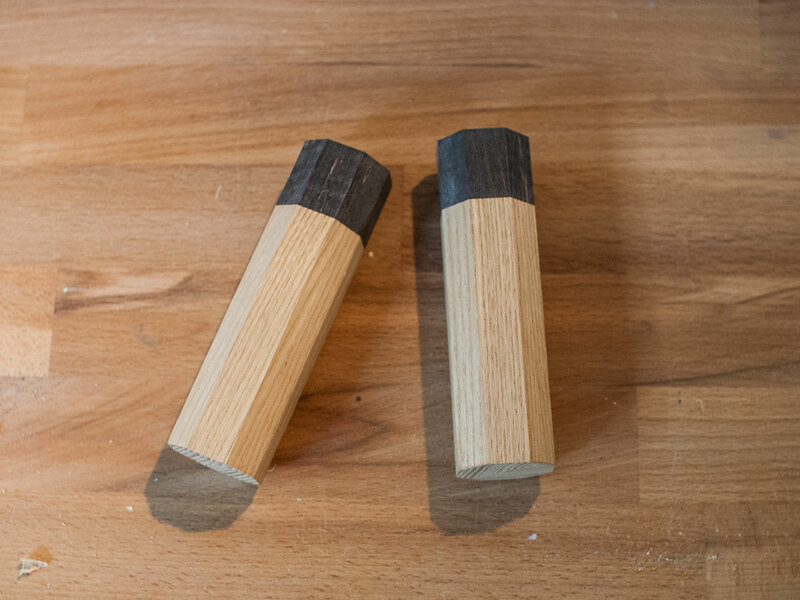 Then I planed a taper into each frame handle. Here you can see the rough shape of the cross member reliefs marked out. 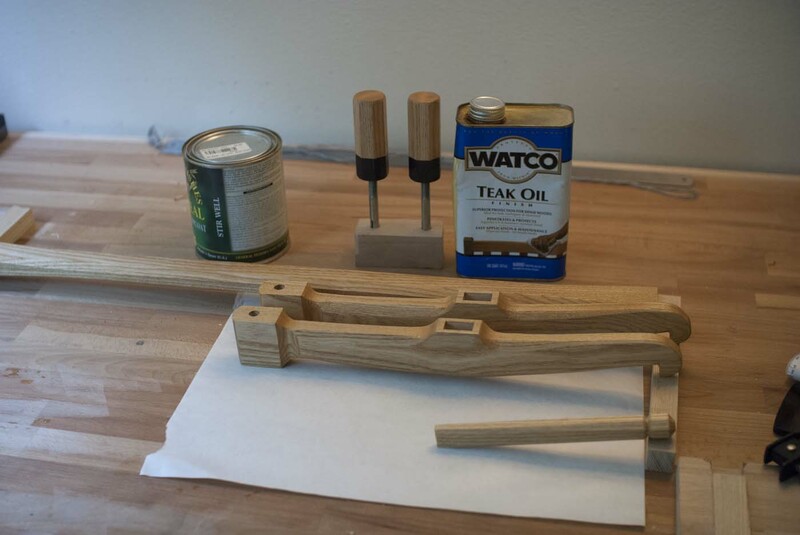 These were then worked out with a spokeshave. 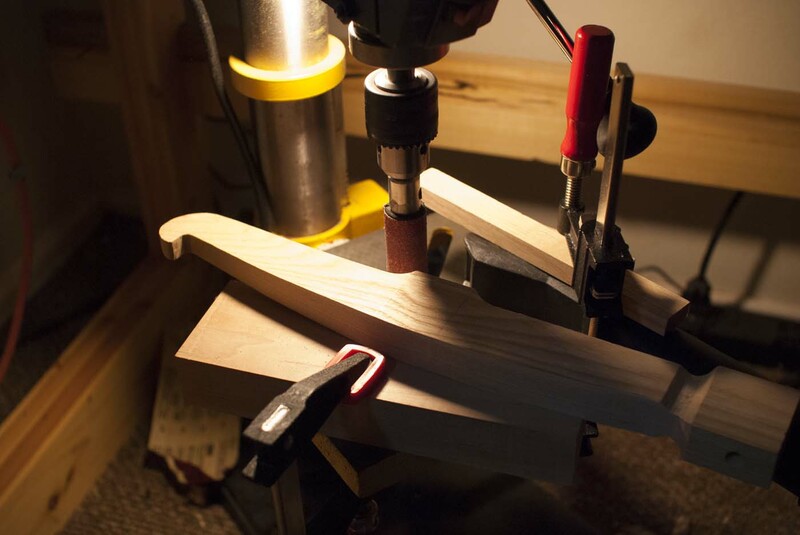 I totally hate these drill press spindle sanding attachments but sometimes they come in handy. I used them for some final cleanup along curves. 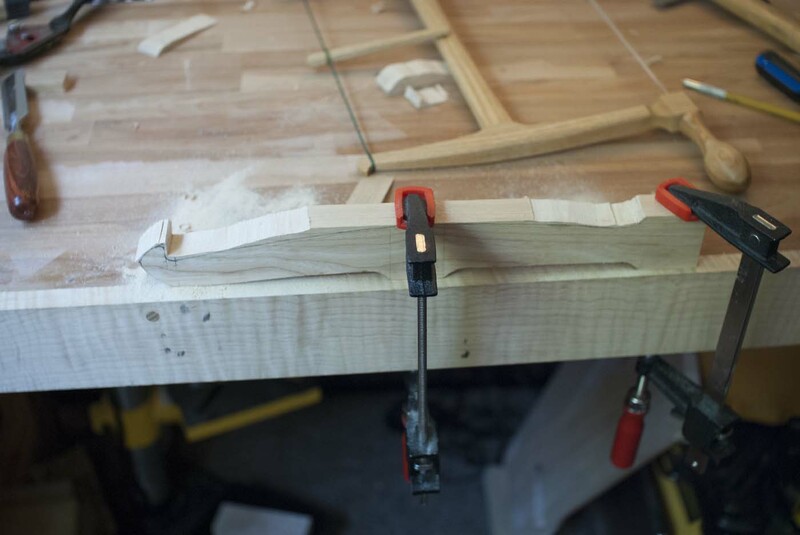 Next reliefs in the frames side were marked and cut with a spokeshave and scraper. Lastly the ends were rounded over to the radius of a film canister lid. 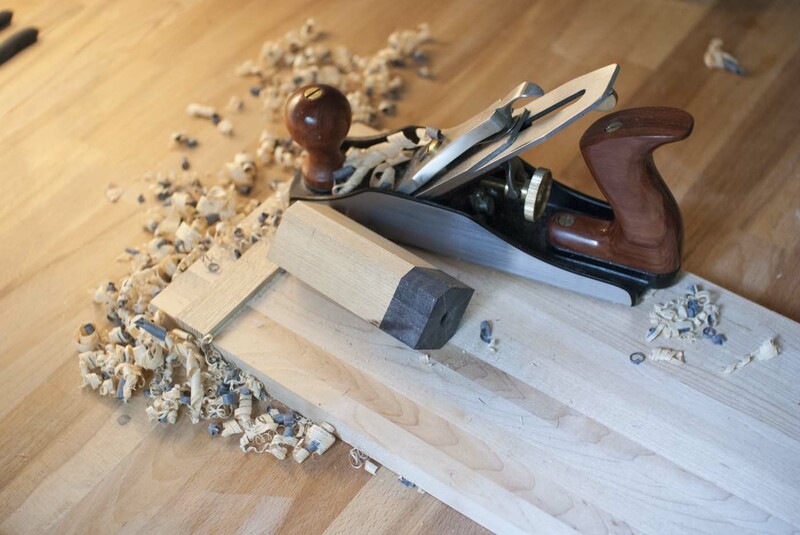 This was done with a block plane and some light sanding. 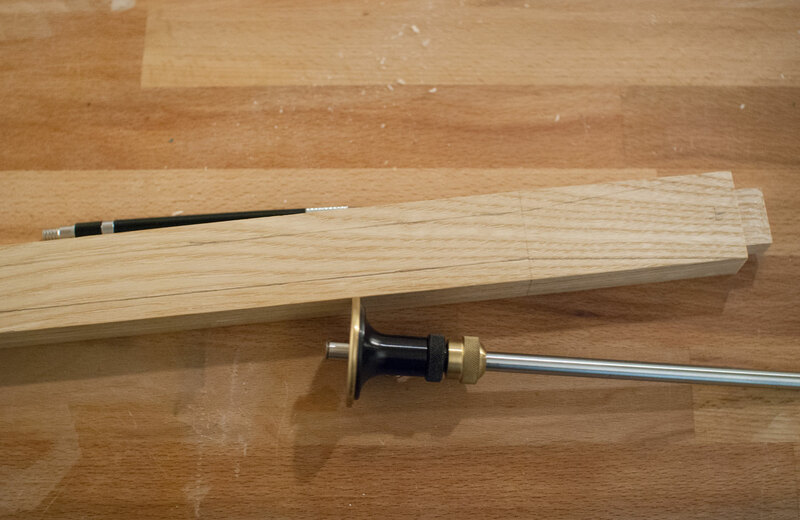 Making the toggle was a pretty straight forward process. 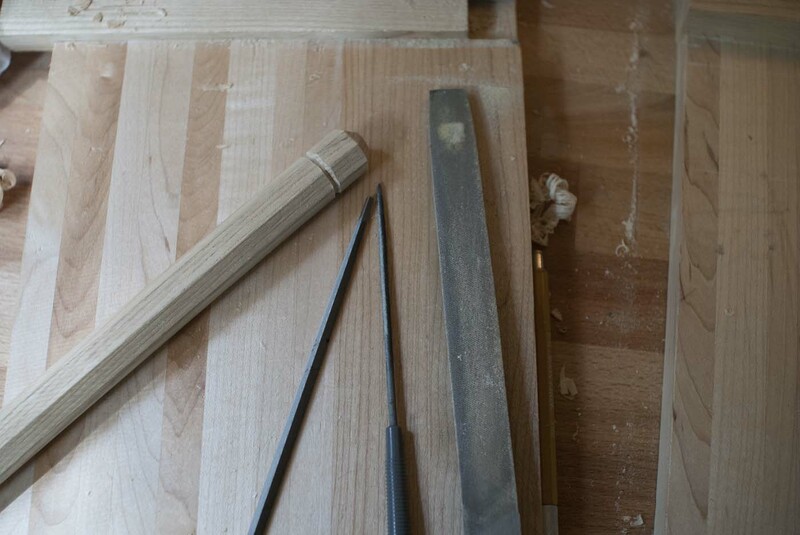 I started with a square profile piece of wood and planed it into an octagon. I used a chisel to facet one end for a semi rounded shape. 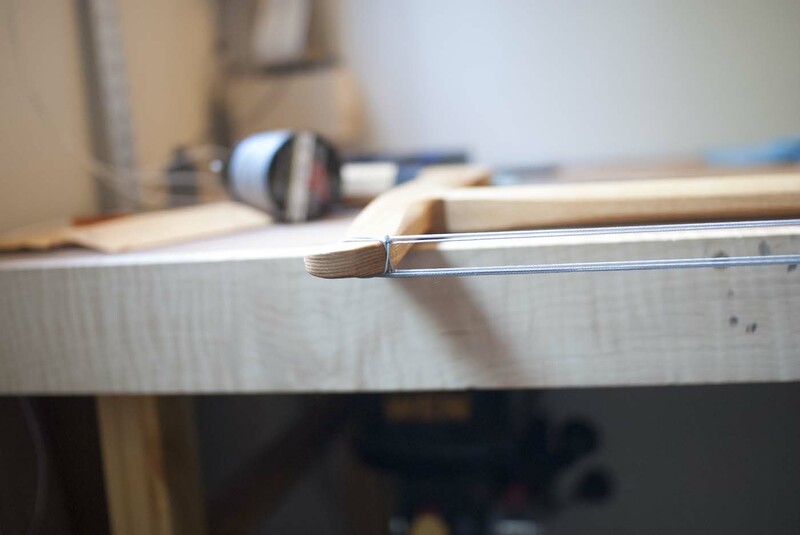 A few files were used to make a notch for the tensioning string to sit in. And lastly it was planed into a wedge. 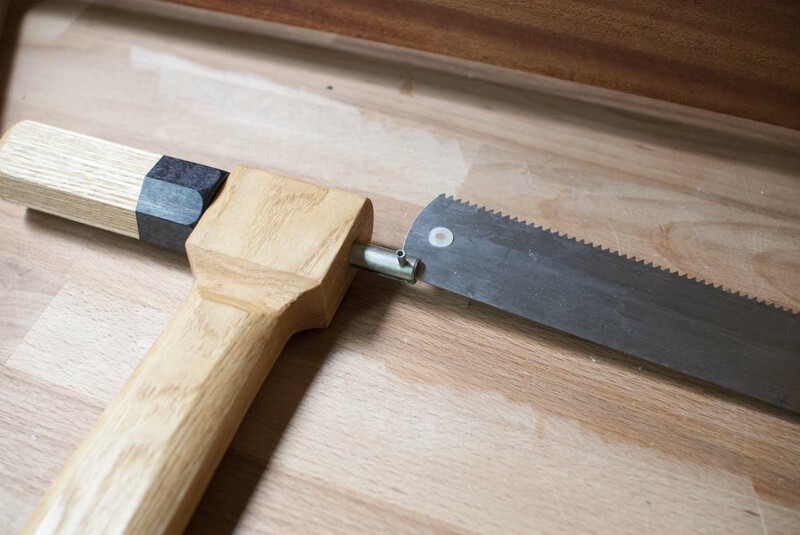 This saw got the same finish I’ve been using on my last few pieces. First a coat of teak oil followed by several coats of wipe of semi-gloss polyurethane that’s then buffed out with 0000 steel wool and paste wax. To attach the line I tied it to one frame side, wrapped the frame 4 times and tied it off on the same side. 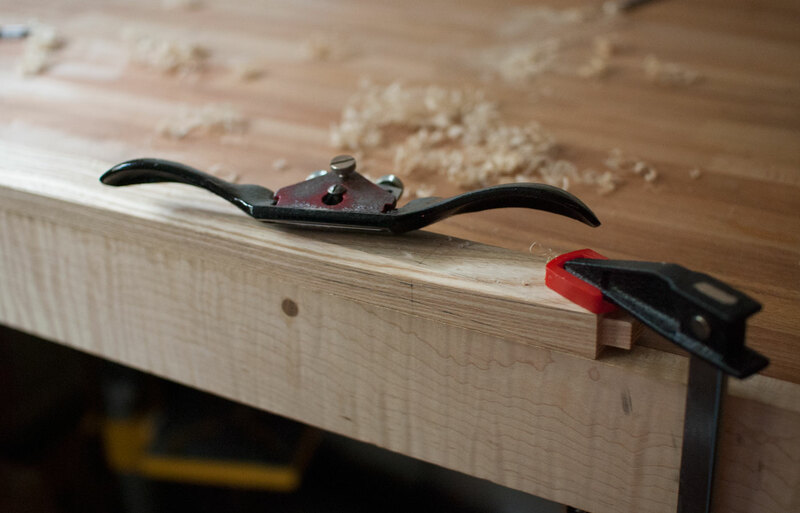 This gives me a total of 8 strands of line and it’s almost frightening how much tension this saw can accept. Nothing has broken yet but sometimes I feel like I should be wearing a face shield when tensioning it. My first tests of the saw were horrible. It was like trying to rip a board with a file. This is my first time setting and sharpening a saw, so I had no idea how much set I wanted. I assumed that I at least wanted consistent set. So I set up this “anvil” (a pry bar) and took down the spots with more set than average. 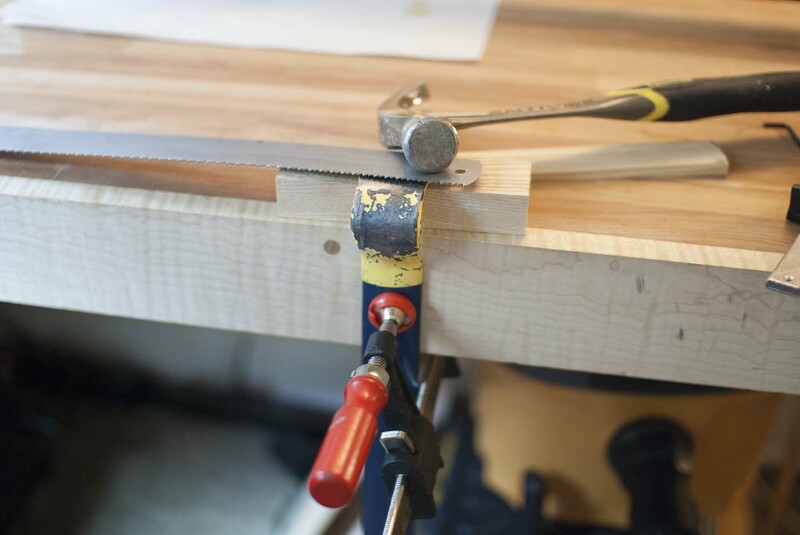 I then clamped the blade to my bench and sharpened it. It took about 3 full length passes of a file for the teeth to feel properly sharp. After putting it back together it was a night and day difference. It now cuts very fast, as I would expect it to. Here’s a close up of how the blade sits in the hardware. 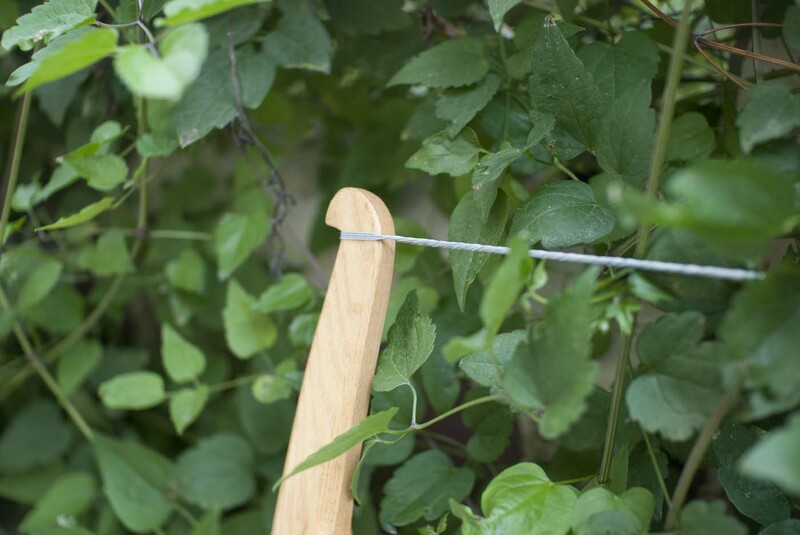 I was worried about the nylon bushing slipping out of place, breaking or deforming. So far after a few dozen cuts they do deform slightly, but not enough to effect performance/stability. 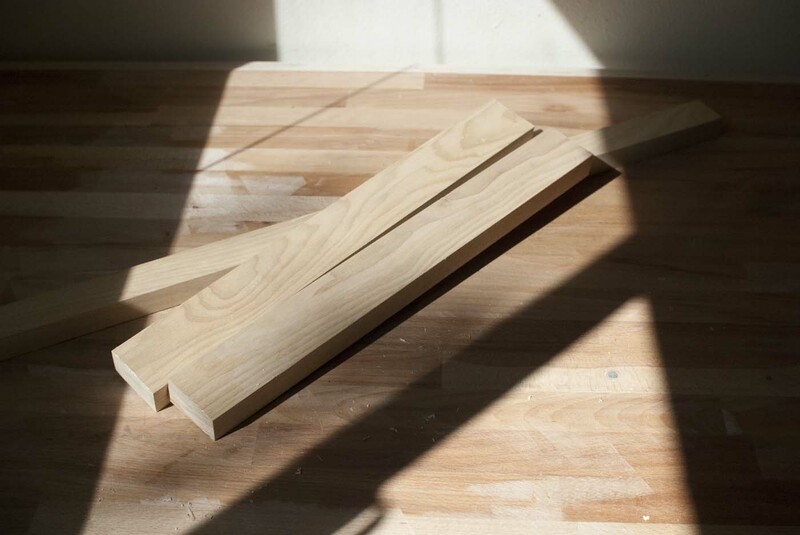 Here’s the first few test cuts in 4/4 white ash. 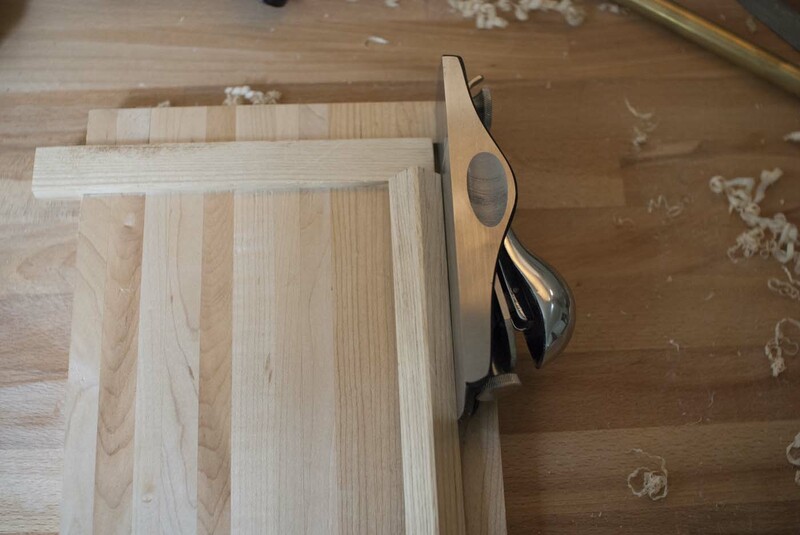 Clearly I need some practice cutting straight at 90 degrees, but the saw does work quite well. The long blade is a lot of fun and gives you plenty of time to focus on form over each stroke. 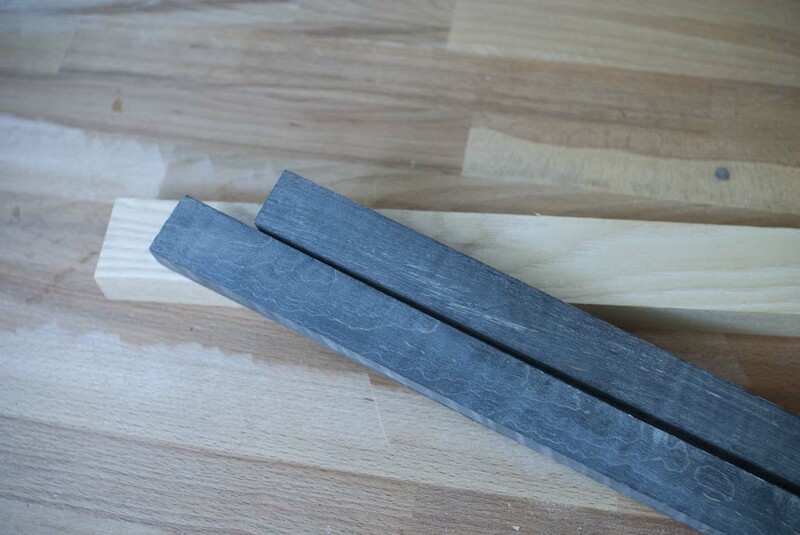 For a kerf comparison the far right cut is from a 14tpi Veritas dovetail saw (the frame saw blade is 9tpi). Big saw with little saw.